Behind every great success story there is a support system. For Kimberly and Alexandra who better to provide accountability and encouragement than someone’s own family? 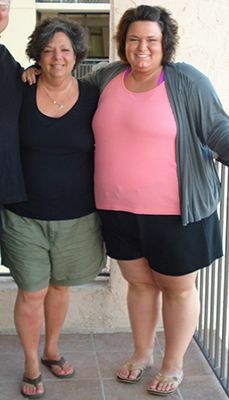 Together, this mother-daughter team battled weight gain and successfully lost over 270 pounds. Kim and her daughter Alex struggled with their weight until they got help from University Bariatric Center. Kim, 55, and her daughter Alex, 23, struggled with their weight for as long as they can remember. 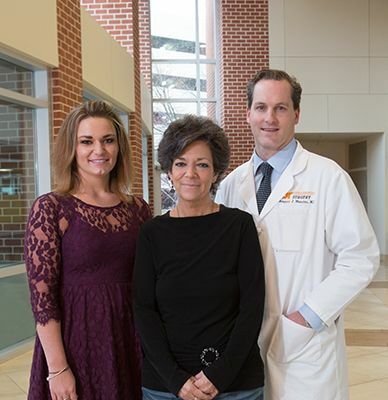 After years of counting calories, numerous diet plans, on and off exercise routines, they found themselves at University Bariatric Center at The University of Tennessee Medical Center in Knoxville, TN. University Bariatric Center helped the mother-daughter team kick their sedentary lifestyle and start eating healthier portions of food after gastric bypass surgery. Before finding University Bariatric Center the mother-daughter duo suffered from their fair share of health problems because of their weight. Both Kim and her daughter were taking high blood pressure medication. Kim had onset diabetes, sleep apnea, and severe acid reflux. Alex suffered from polycystic ovary disease (PCOS), a condition attributed with obesity that can lead to hormone imbalance, menstrual cysts in the ovaries, diabetes, heart disease and eventually trouble conceiving a child. Alex, only 23 years old, was troubled by her health and her future. After consulting with University Bariatric Center she and her mother decided to have gastric bypass surgery. Gastric bypass and other weight-loss surgeries are considered when regular diet and exercise haven’t worked or when you have serious health conditions because of your weight. One month a part, Alex and her mother successfully had gastric bypass surgery. Kim originally had reservations about the procedure, but her fears were quickly put to rest after learning that the weight loss surgery was performed laparoscopically. Laparoscopic gastric bypass surgery is a minimally invasive bariatric surgical procedure that requires smaller incisions resulting in less pain, faster recovery and fewer complications. Together, Alex and Kim lost over 270 pounds—far above their original goal. Looking back on the experience Kim credits her success to University Bariatric Center for the amount of preparation and support they received before and after the surgery. Daughter, Alex (left), and her mom, Kim (right) with Gregory J. Mancini, MD, who did their gastric bypass surgery. “Preparing yourself for the life after weight loss surgery is important to keeping off the weight. In addition to the support we received; the staff at University Bariatric Center gave us resources, tips, eating guides, and healthy recipes before surgery,” says Kim. From your first consultation, to living life after weight-loss surgery, University Bariatric Center is there every step of the journey. For Alex and her mom, the journey has just begun. The mother-daughter pair enjoy exercising together several days a week and makes sure the other is keeping up with their healthy eating habits. Every year they take a shopping trip to New York City, but this year they plan to pack more into their trip than ever before because of their new found energy and joy of shopping for clothes. These little things have turned into a new life for their family. Kim’s husband and Alex’s father, Mark, 56, also decided to have weight loss surgery in January 2013. He is excited to join his wife and daughter in their new journey, as a family, they are dedicated to living a long and healthy life. To find out if you are a candidate for weight loss surgery, please call 865-305-9355.